Owner Barney Vincelette recently sent me the two photos below; the first is a nice recent shot of his Futuro and the second is a view of an interesting mural that forms a part of the interior decor. 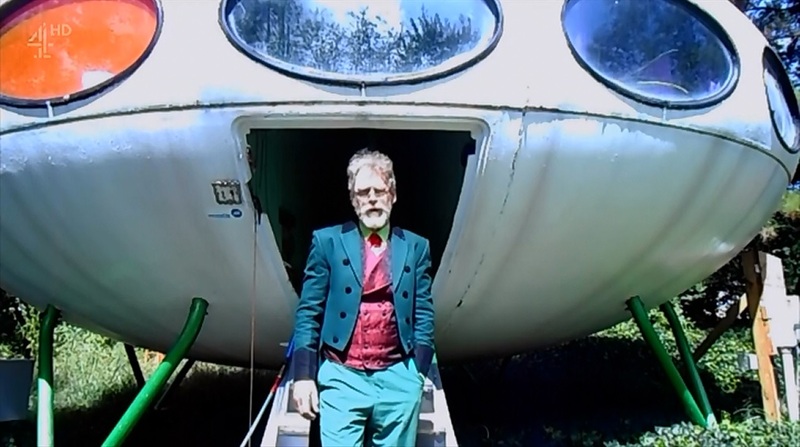 The screenshots below are from British TV station Channel 4's show World's Weirdest Homes which aired 120615 and featured Barney Vincelette and his Futuro. These three photos were taken by Gary A. Know 070815 and are displayed here with Gary's permission - thanks Gary. I love the black and white shot; for some reason black and white photos, to me at least, always seem to have more atmosphere. 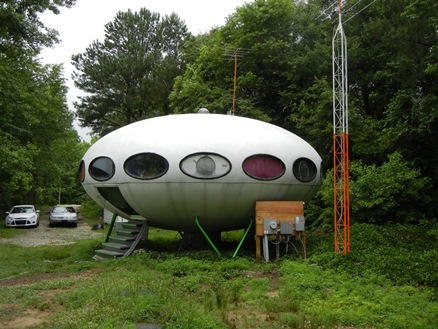 I have never seen many photos of this Futuro but this week owner Barney Vincelette kindly sent me this set of photos taken recently by Bob Pavlik, an architecture professor from Oklahoma University who is traveling the USA and studying Futuros. My thanks to both Barney & Bob for sharing this great set of photos. 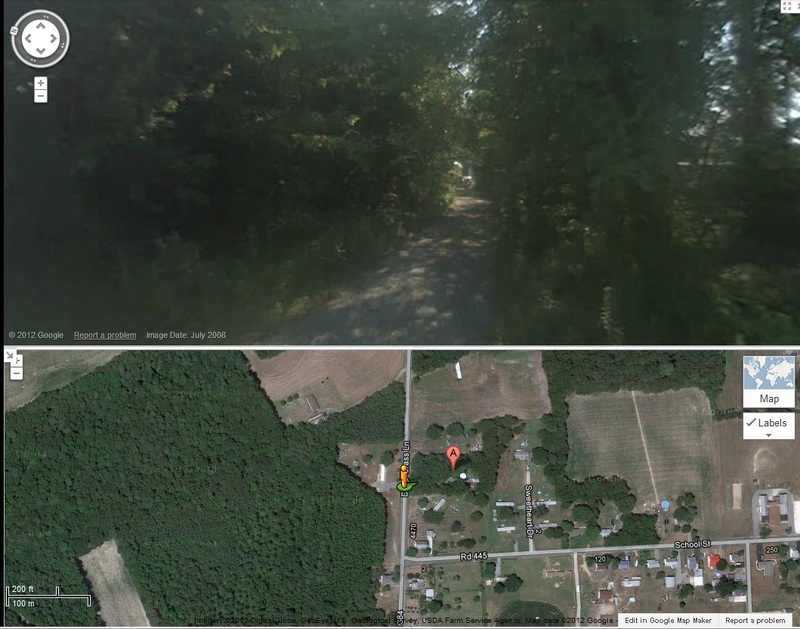 The image below is a screen grab from Google Maps in Street View; you can actually just make out the right side of the Futuro poking out from the trees on the left side of the driveway [Open in Google Maps]. Several of the US Futuros are among the most poorly maintained examples; Greenwich, Royse City [despite its relatively recent "facelift"] and Media come to mind. 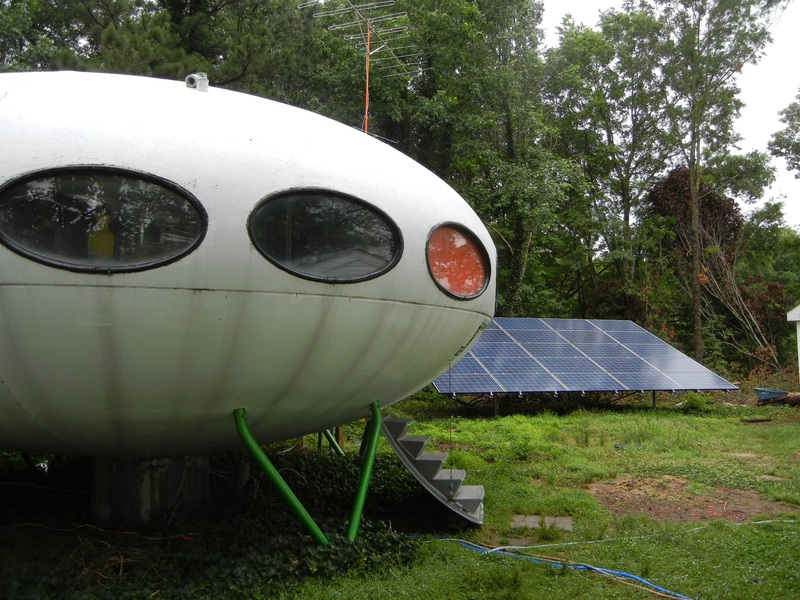 At the other end of the scale is Barney Vincelette's home for almost 40 years, the Houston Futuro. "... the official list of the Nation's historic places worthy of preservation." I may be a little old and cynical but in my experience government agencies are not known for their speedy response to anything so, not surprisingly, Barney tells me there has not yet been any response to his submission. That said anything that can be done to help preserve the remaining Futuros should be done [I may be a little biased] and so, with Barney's permission, I am sharing his application here. It can be used as a "template" should any other Futuro owners here in the USA like to make a similar submission. The document can be found here in .pdf form. If anyone would like a word version let me know; I can be contacted directly by email or via my Contact Form. Thanks for sharing Barney. Here's hoping your submission gets approved eventually and that others may follow. 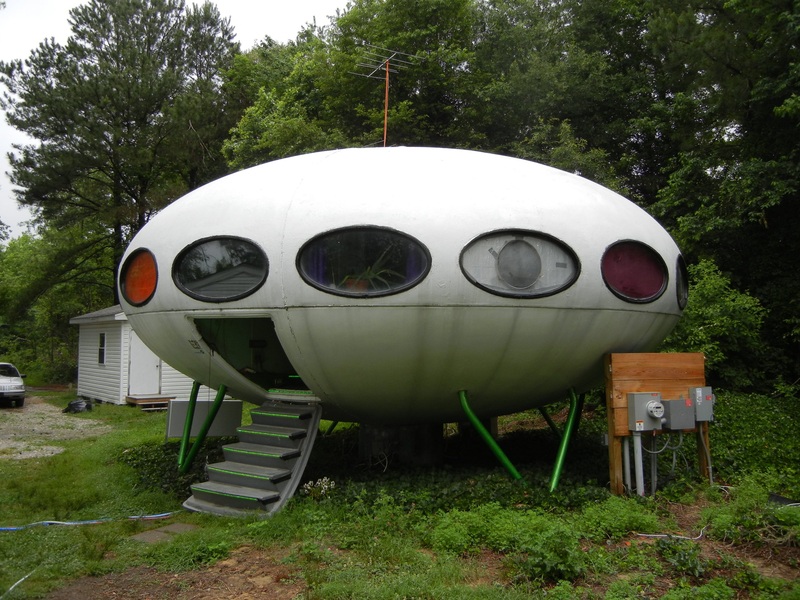 "... the world's 20 weirdest, most fascinating and jaw-dropping homes ..."
The Futuro House made this countdown at #10 and features in a three minute section of the show [starting at 33:55]. 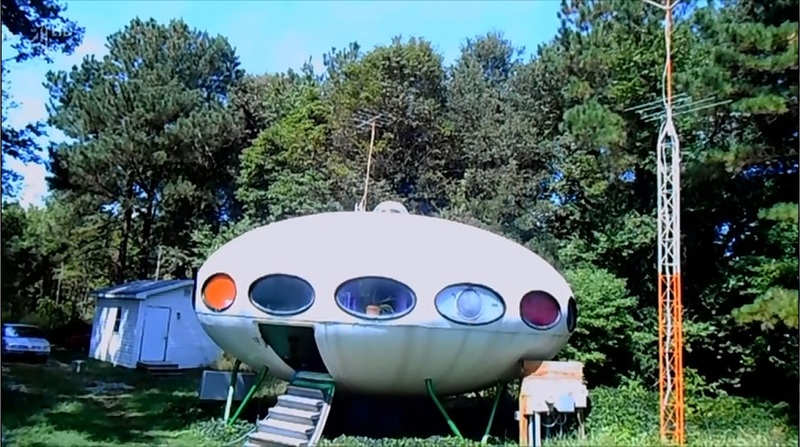 While there is a little Futuro history, a few vintage photos and a little vintage footage the primary focus is a "video diary" made by Barney Vincelette that features his Houston, DE Futuro. Obviously for copyright reasons I cannot embed or otherwise provide access to the show here. Through 010516 the show can be streamed from the TV stations website here but it is geo-tagged and only available from UK IP addresses. The show can be located and downloaded online but you will have to find it for yourself. 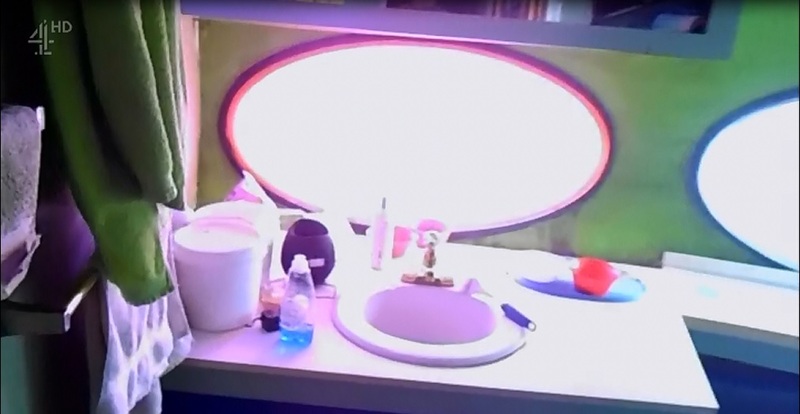 I have added a few screenshots from Vincelette's footage to the left; hopefully this is not too egregious a breach of copyright. On 062315 CapeGazette.com published an article by Ron MacArthur titled 2015: It's Still A Space Oddity. 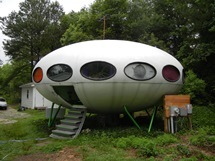 The article was based on conversations with Joe Hudson who has several ties to the Futuro House and Richard Garrett who currently rents the Milton Futuro. Joe Hudson's ties to Futuro include being the owner and operator of New Dimensions Of Delaware Inc., a Futuro distributor "back in the day", owning the Milton Futuro and selling the Houston Futuro to longtime owner and resident Barney Vincelette. 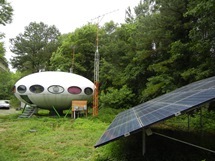 Information about New Dimensions Of Delaware Inc. can be found here and of course the Milton Futuro has its own dedicated page on this site. "... a model home once owned by Hudson that was sold to Barney Vincelette who has lived there for nearly 40 years." "He was diving at me waving a towel. He cut back on the throttle, opened the canopy and yelled for me to meet him at the airport. 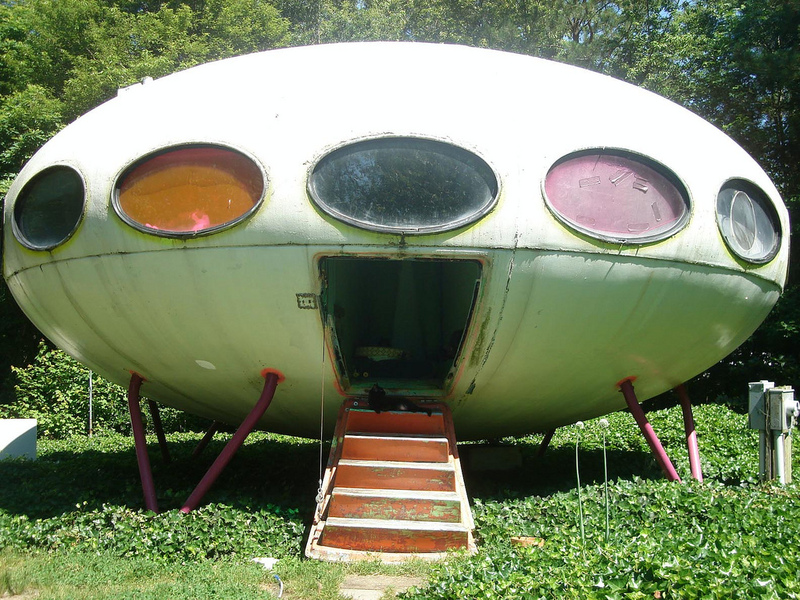 "He [Vincelette] was desperate to get one of the models so we took it apart and put it on a tractor trailer, but the state of Georgia would not let it in"
"Barney said if the space ship couldn't come to Georgia then he would come to Delaware." 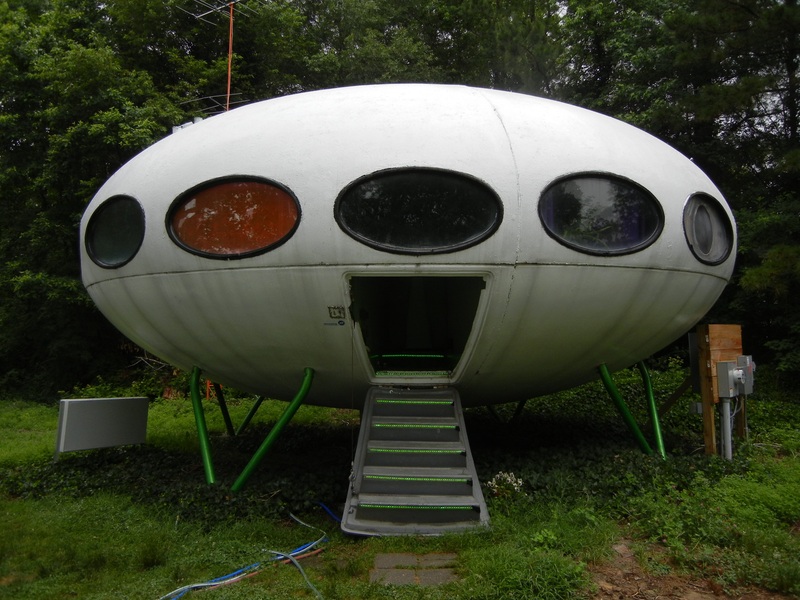 As noted earlier Barney Vincelette has lived in his Futuro for almost 40 years [has to be the record] and over that time he has made modifications to the unit. Coincidental to the MacArthur article Barney recently sent me details of a couple of those modifications. The modifications would likely not be appropriate for a museum piece that designed to showcase the Futuro "as manufactured" but Barney's house is a "lived in" functional residence and modifications that improve quality of life make sense. 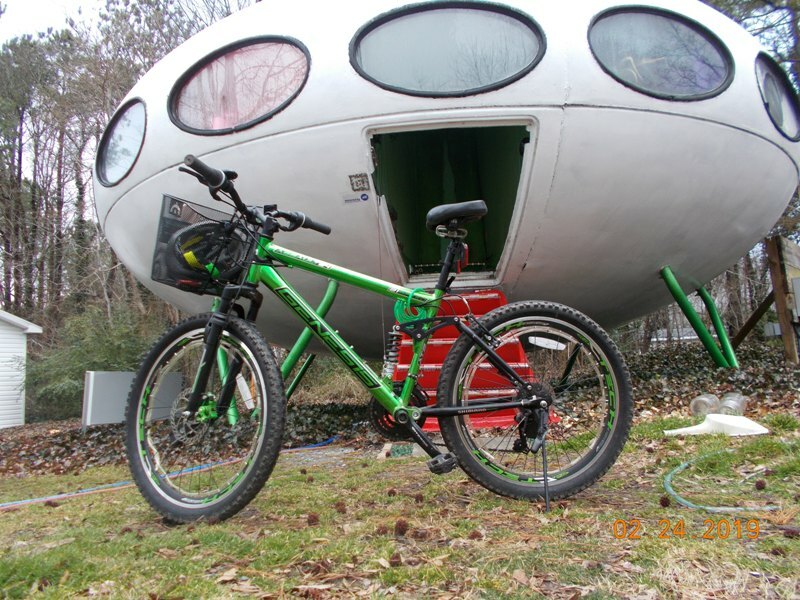 While no one person can truly speak for another I imagine Matti Suuronen would approve of modifications which allowed one of his creations to continue to provide a home for someone after all of these years. 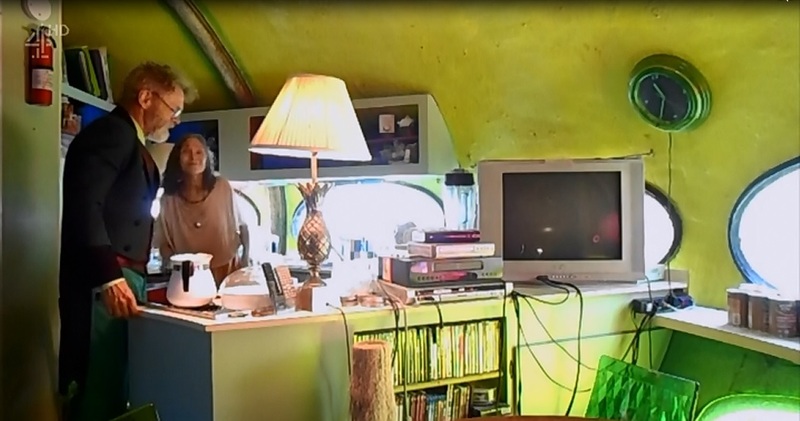 "The chimney that was built for the fireplace was a heat waster and the indoor fire pod was, in my opinion, too dangerous for a house that can never be replaced if the fire spreads." "Keeping it from dripping during rain was as frustrating as trying to milk a cow with condoms glued to its udders." 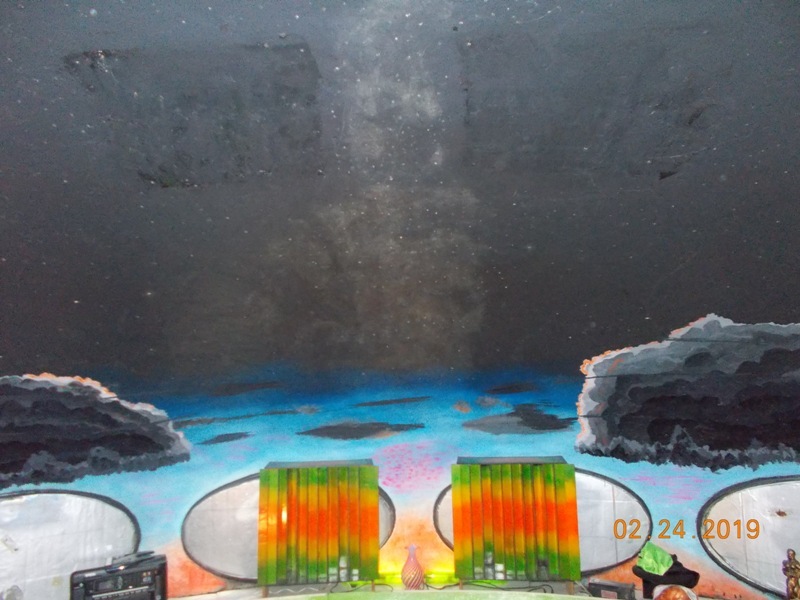 To mitigate this problem Barney removed the entire octagonal sheet-metal piece and replaced it with a 34 inch diameter Plexiglass bubble caulked in place; this completely solved the leakage problem [the "bubble" can clearly been seen in this photo]. 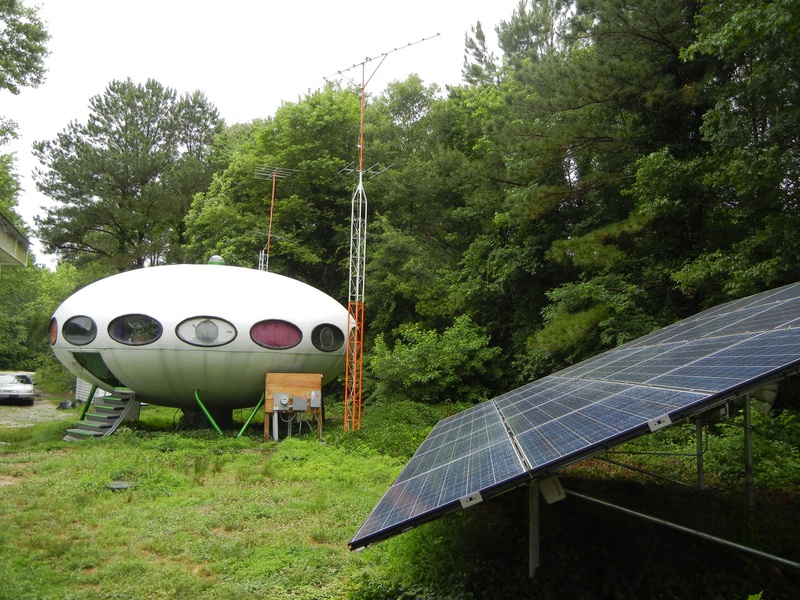 "... the original heating and air conditioning system was adequate in its day, but electricity is now so expensive that even though it takes less to heat a Futuro than it does to heat a more conventional house, it is still over $500 in a cold month." "... takes up about four square feet of floor space, but it is much easier to maintain the system." Other modifications over the years include replacing the door mechanism [a system of pulleys that wore out difficult to replace cables] with a direct electric winch wired to operate either directly or by remote control, reworking the micro-switches that limit the up and down movement of the door and protecting the exterior gel-coat with a good quality latex house paint to prevent UV damage. 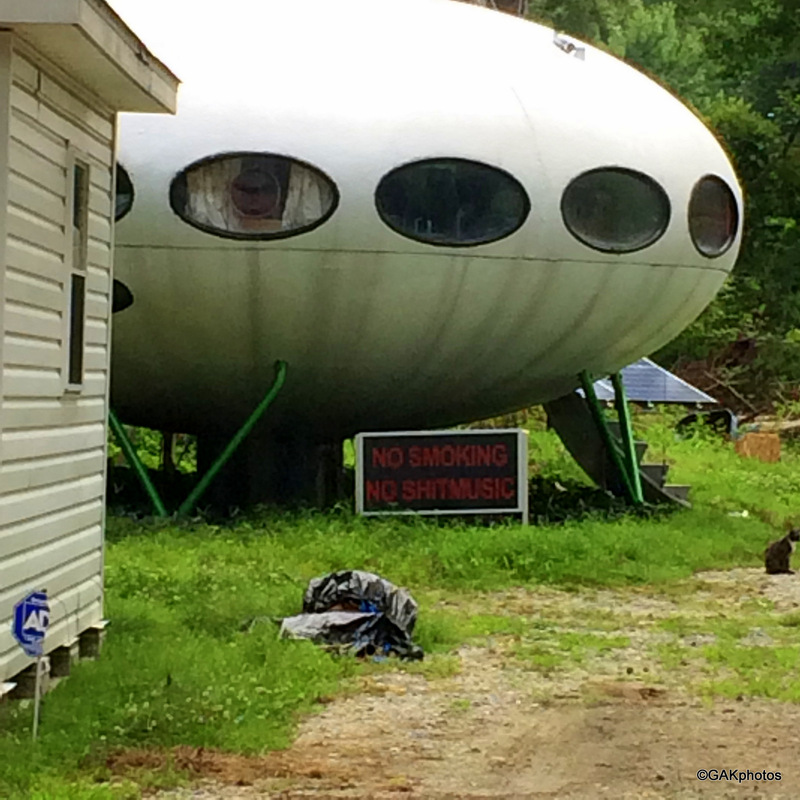 Many thanks to Barney sharing all of this information; it is interesting to hear about all of the changes and improvements made over the years to what is almost certainly the most "lived in" Futuro there is. 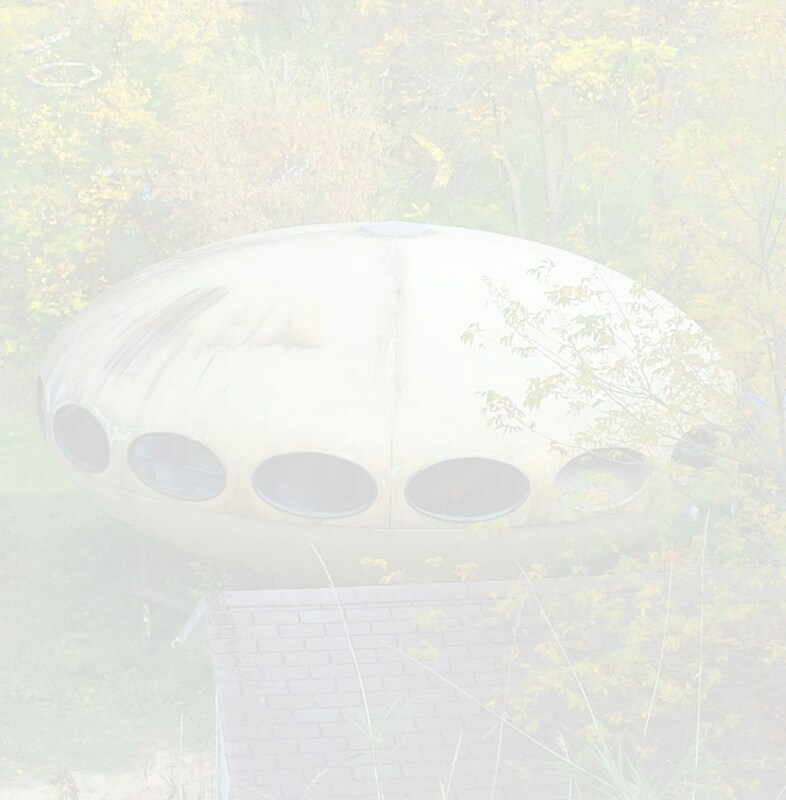 Barney Vincelette recently sent me an email with some clarification on the history of the [demolished] Broadkill Beach Futuro. 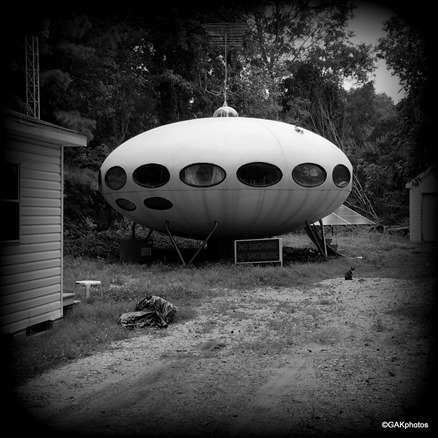 That email also contained a couple of little "nuggets" relating to the history of Barney's Futuro. 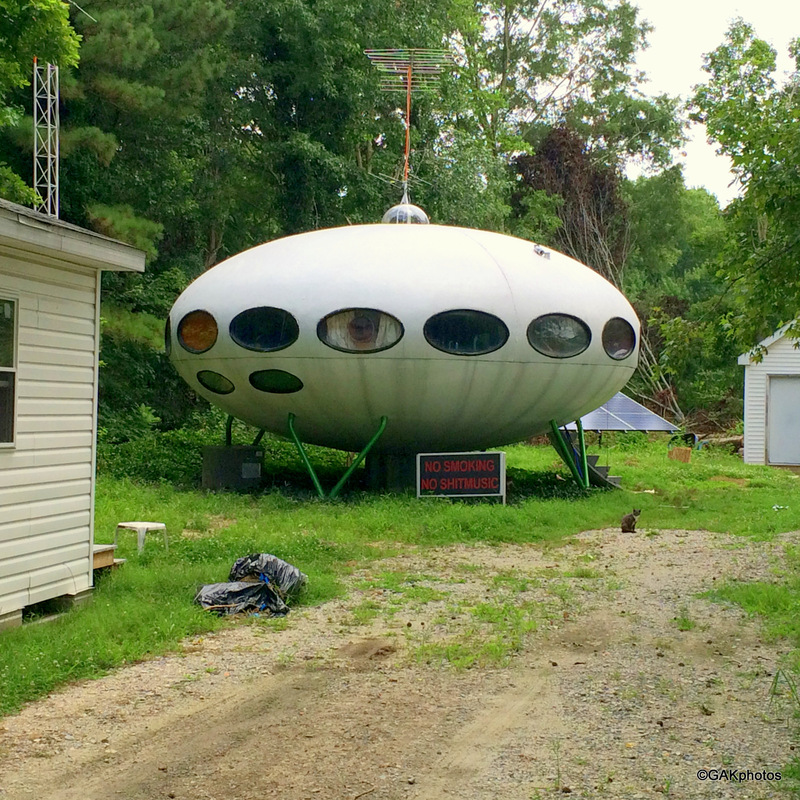 It seems that before Barney purchased his Futuro from Joe Hudson in 1977 it had previously spent time on display in 5 Points in Lewes, DE; at that time it was actually painted blue as was the Milton Futuro which was at that time also on Broadkill Beach. The original blue oil based urethane paint did not hold up well and so the Futuros were at some point repainted white. 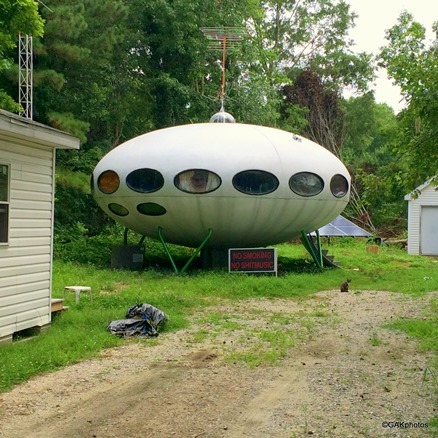 "... an Amish man lived in it and drove his horse drawn carriage to Milford Airport (which no longer exists because it was sold and is now a Wal-Mart) and flew an expensive twin engine airplane." "... a person who embellishes stories so splendidly that nobody wants to check them for accuracy because it would be heartbreaking if they were not true ..."
Make what you will of that. Thanks for the info Barney - keep it coming! 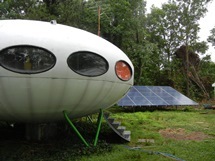 Barney Vincelette, longtime owner and resident of this Futuro House, posted a very interesting article on Nest-Mag.com on 042214. The article was posted under the heading "Living in a Matti Suuronen Futuro House" and in it Barney recounts some of the history of his interest in the Futuro House and how it was that he came to reside in one. Rather than try to paraphrase Barney I think it makes more sense to read Barney's own words which can be found here. Check it out! The other day Barney Vincelette kindly shared with me this somewhat unique and extremely humorous photo of his home. The photo is displayed here with Barney's permission. In the email Barney sent he also recounted a little of the background to the sign that features prominently in the photo and, since I believe the best and most faithful recounting of any story is always when the story is told in the words of the protagonist, I thought it most appropriate to tell the story using Barney's own words. "built the sign after using locomotive horns to harmonize with the neighbors who from several hundred feet away played music I did not want to hear in my back yard on their stereos. The law gave them the right to play music at any volume because "a reasonable person" would not object to music as "unreasonable noise." 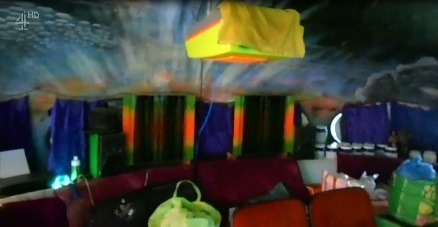 "if the neighbors have the right to play their music I have the same right to play mine (even though the commuter class locomotive horns I got from www.trainhorns.com are rated at 152 dB)." "even tape recorded (his) Sonata for Calliope of Truck Horns later transcribed to locomotive horns and had it evaluated by an orchestra musician in the Netherlands and an affidavit for court that what (he) played was music." It seems that tenacity, ingenuity and plain old standing up for your rights won the day and the prosecutor threw in the towel leaving Barney able to use his locomotive horns as needed to drown out intrusive music or perhaps more likely cause the volume to be turned down. Me I say "go get em Barney." 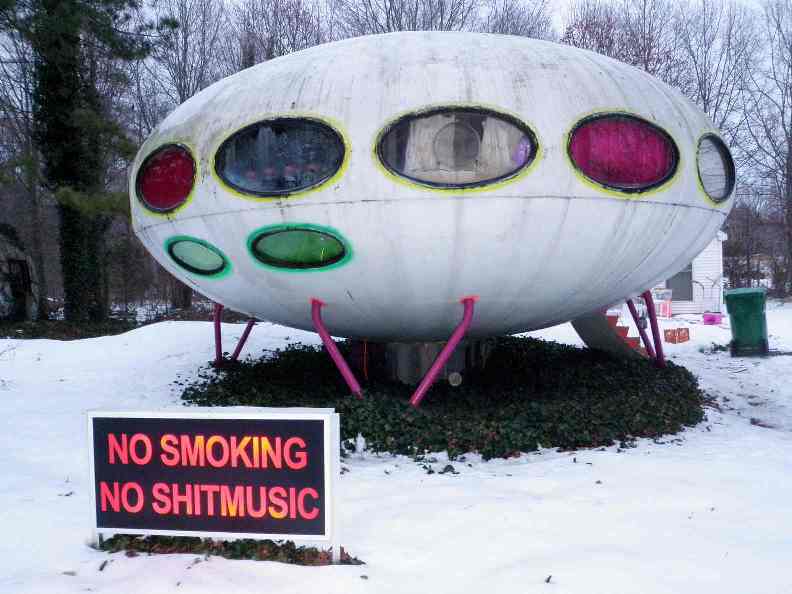 Whatever the law says about "music" and "reasonable people" I have had to put up with loud intrusive music from neighbors before and let me tell you - it is NOISE. Maybe next time I will not just "grin - or is that grimace - and bear it" but instead take a page out of "Barney's Book" and pay a quick visit to www.trainhorns.com. Barney - thanks so much for sharing your story and your photo. Barney Vincelette can be considered, at least by any reasonable standards, anything but "ordinary". An agnostic free thinker that grew up in the world of the 50's and 60's Vincelette has been institutionalized, spent time in the Air Force [and in Vietnam], worked odd jobs, earned two MS degrees and then followed those with PhD in mathematical physics, shocked with surrealistic [and to some obscene] art and authored a couple of bittingly satirical books; "The Autistic Comedy " and "The Night of God's Suicide ". 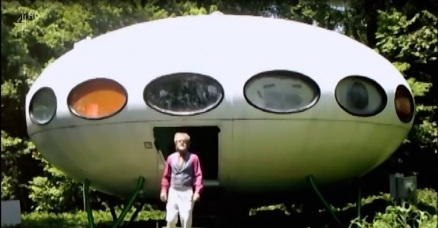 Given such a diversity of life experiences and a nature often and not unreasonably described as "eccentric" it should not be too surprising that such a man might choose to live in a Futuro House and that is exactly what he and his wife Carol do. In an article on the website Dangerous Minds Vincelette is quoted as indicating one reason for his home choice; he likes the "geometric simplicity" of the home. His wife Carol apparently is a little more down to earth [no pun intended] and has simply observed "it doesn't have enough space". Vincelette suffers from a mild case of autism and is extremely sensitive to noise to the extent that he has actually constructed devices designed to interfere with and suppress neighbors radios and like devices - see articles from WBOC.com and Persephone along with Vincelette's very own article describing how to construct, among other things, an "FM Jammer" and a "Microwave Canon" both of which are designed to interfere with and suppress your neighbors ability to create loud noise. 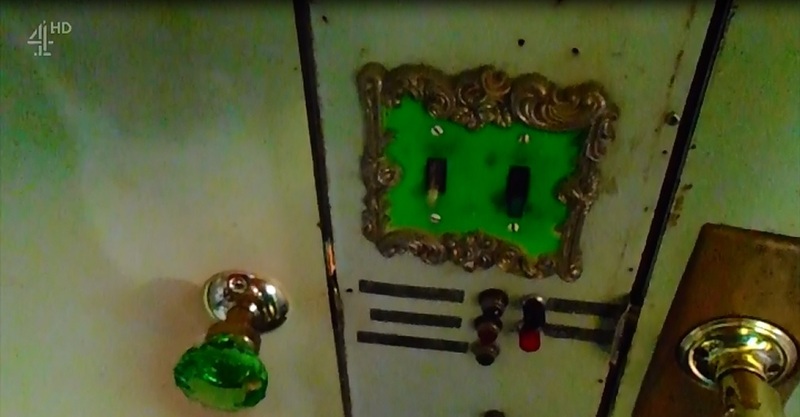 All in all it seems we have a very eccentric individual who has chosen to make his home in what many would see as a very eccentric house; sounds to me like a match made in heaven. Personal correspondence with the owner 030219.